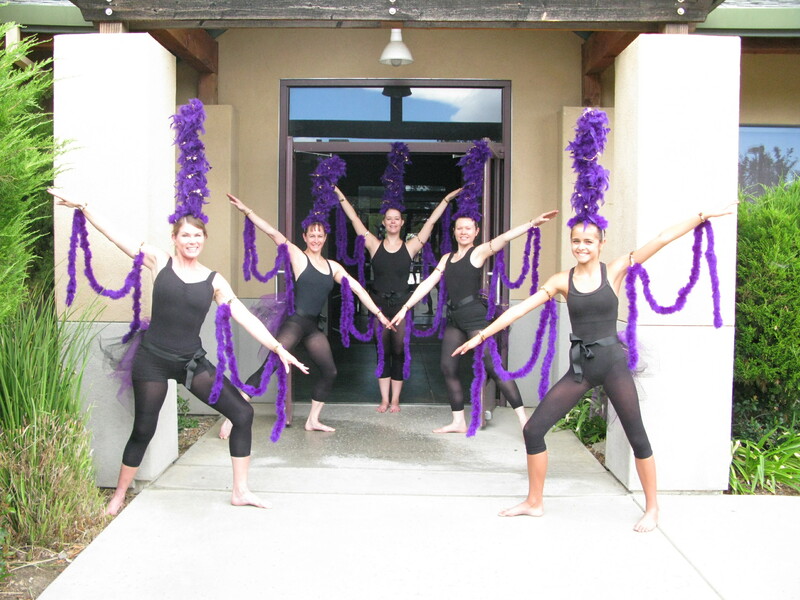 The PTDT costume philosophy is often “simple is better”. Having a clean, unified look not only makes the dancers look sharp, but prevents costumes from interfering with the athletic style of dance. 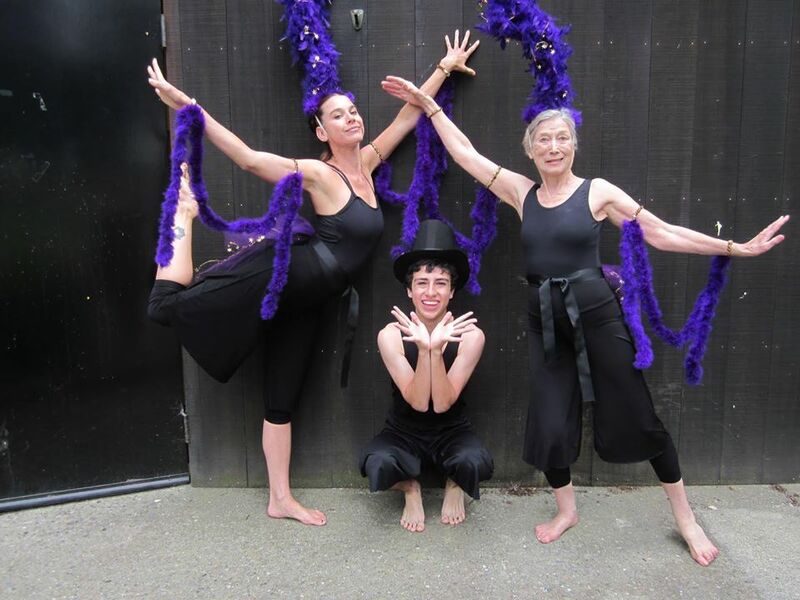 In recent years, our dancers tend to wear black gauchos and a simple black leotard. The basic black costume can be easily layered with a colorful shrug. Occasionally, however, our costumes are flamboyant. Three recent concerts featured eye-catching costumes. In the piece “Get Off The Internet” in “2Be/Not2BeConnected”, the apprentice company wore sequined caps connected with ribbons to look like Cat5 cables (the wires used to connect your computer to the internet). “Wolves/Sheep/We Are the People” had pieces with the Apprentice Company dressed in fluffy sheep costumes moving as a heard. Daniel Dutulescu, a Third Stage Dancer, wore a faux fur wolf hood to chase the sheep. In “Negotiating Meaning”, Third Stage and Apprentice Company dancers wore showgirl costumes complete with feathered headdresses, arm drapes, and tulle bustles in several pieces. The costumes were recently used in promotional photos for upcoming events. How do costumes get made? It depends on who is making the costumes, but here is how it works when dancer Michele Tobias makes them. First, Director/Choreographer Pamela Trokanski comes up with a concept for the costumes. In the case of the showgirl costumes, the idea was simply “showgirls”. Next, Michele does research. The research is often online image searches to produce ideas, to see what is available for purchase, and if there are craft blogs that have directions for how to make pieces that we might use. The costumes need to look the part, but dancers need to be able to move in them. Michele then often brings sketches, printed photos, and sometimes fabrics to Pamela to discuss options. In the case of the showgirl costumes, Michele made a file in a vector illustrator with a digital paper doll with multiple headdress and accessory options to explore which options were best. With the details worked out, Michele makes an estimate for the cost of the materials needed. Once Pamela approves, the costume manufacturing work starts. Why does PTDT often make costumes rather than buy them? Simply for the reason that it often ends up being less expensive. For example, to purchase one showgirl costume from a costume retailer would cost $100, if not more. Making 12 costumes cost less than $300, but it took many volunteer hours. We try to keep the cost per costume under $40 per costume and welcome your tax-deductible contributions to help support costumes design and creation. The costumes we make and purchase are high quality to ensure that we can use them repeatedly. The cost for costuming is covered entirely by donations and volunteered time. How much does costuming PTDT cost per dancer?